Beautiful Home in the Tall Pines with Great Views! Three Pines is a beautiful 3 bedroom home in the tall pines just 5 minutes from downtown Prescott. Located in a quiet neighborhood, just south of town, it has everything you are looking for in a vacation rental. The living room is lovely and comfortable with a large flat screen CAB/TV and great views of tall pines and nearby mountains. Plush, thick carpet throughout the house makes it feel as if you are walking on a cloud. The dining room has a large table, sits six and invites guests to share meals or play games while enjoying the southwestern splendor. A nice western facing deck with table and chairs and propane grill is right off of this dining room. Whether it is your first cup of coffee or your evening glass of wine this is where you will want to relax. The galley style kitchen has a dishwasher and all the pots, pans and dining ware for simple snacks or gourmet dinners. Three Pines is a three bedroom home that sleeps six. The master bedroom has a king bed, CAB/TV and is on the main floor that includes a little sitting area. The master bath has a tub/shower combination. The other 2 bedrooms both have queen beds and are down a flight of stairs to the lower area. These two bedrooms share a bath with a tub/shower and have their own deck with views. One of the second bedrooms has another small CAB/TV. This property is filled with interesting books and games. Lovely, unusual decorations are in every space making this house delightful and eclectic. Three Pines has beautiful views from all windows. The back of the house faces rugged riparian scenery that is remarkable. It’s a reminder of how beautiful Prescott is surrounded by National Forest. It’s a very quiet setting. It is located on a road only used by permanent residents. It is not a thoroughfare for any other streets. Local hiking trails are nearby for the outdoor enthusiast. Internet and washer/dryer makes your stay modern and efficient. 2 car garage available for use. 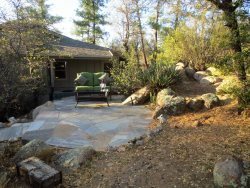 For a lovely vacation or extended stay in Prescott, Three Pines is your home away from home any time of the year!